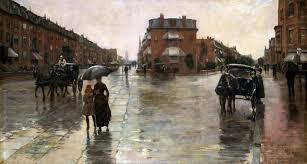 The realistic painting is “Rainy Day, Boston”, painted in 1885, some eight years after Gustave Caillebotte painted his “Paris Street, Rainy Day”, which is strikingly similar in its portrayal of broad streets that fork off from one another around a building. We have no evidence that Hassam was aware of the Caillebotte painting and so we may simply be in the presence of simultaneous invention, as occurs when Matisse’s “Dance”, from 1910, is generically similar to Picasso’s “Les Demoiselles d’Avignon” from 1907. Both of them concern having a new way to do group portraits of abstracted sets of women. There are somewhat stylized but recognizable figures dancing about in a circle in Matisse and a group of also stylized women standing around and playing off of one another in the Picasso. The colors may be different but both artists were looking to create stylized versions of figures in motion now that the two artists had overcome realism. It was bound to happen. So examine “Rainy Day, Boston” in its own right. The houses on both sides of the street and in the foreground are new, red brick, clean and with no garbage about, the sidewalks clear. The rain collected in puddles up and down the cloven roadway are realistically done, caught in detail in the ways the pavement’s irregularities make each puddle slightly different in shape and extent, as well as making the entire street glisten with wetness. The people huddle under umbrellas, one woman raising the hem of her skirt so it won’t get wet. But she and the other people are not the central interest of the picture, nor are the three horse drawn taxis. Rather the focal point of the picture is the house at the intersection of the two streets, what with its white awnings to shield the building from the sun when that breaks out. In the distance, there are some big buildings. What with the broad streets and the new buildings, this is a very inviting residential neighborhood, even if it is caught up, at the moment, in the rain, which makes it all the more interesting because it is seen in this altered state. Quite an impressive artistic performance and a bit different from Caillebotte, who makes his people more prominent but who also highlights that he is portraying a prosperous residential neighborhood. Life in the late Nineteenth Century could be quite comfortable, not just a tale of slums and squalor once you came to the city from the country. Hassam painted his “Snowstorm, Madison Square” not much later, in 1893. This picture might seem very Impressionist because the snow filled atmosphere draws a screen through which the Madison Square area is to be seen, but that would be misleading because this is a realistic account of what it is to look at things through snow. There are the ubiquitous horse drawn taxis and a trolley. People walk through the slush. There is an equestrian statue and leafless trees in the park and there are low houses in the distance beyond the park. Hassan just does one of the many ways one can portray city snow. Here, it turns to slush on the pedestrian filled streets while it is a white carpet in the park. Hassam treats snow in the same way in his “Brooklyn Bridge in Winter” where the snow is not that thick but creates a haze in the air while just being a blanket on the tops of buildings. That is quite different from the snow that overtook New York City in 1947, where it was a blanket in some places, sludge in others, and mounds and mounds of it, taller than a child, in still other places. Boy, snow used to mean something in New York winters. 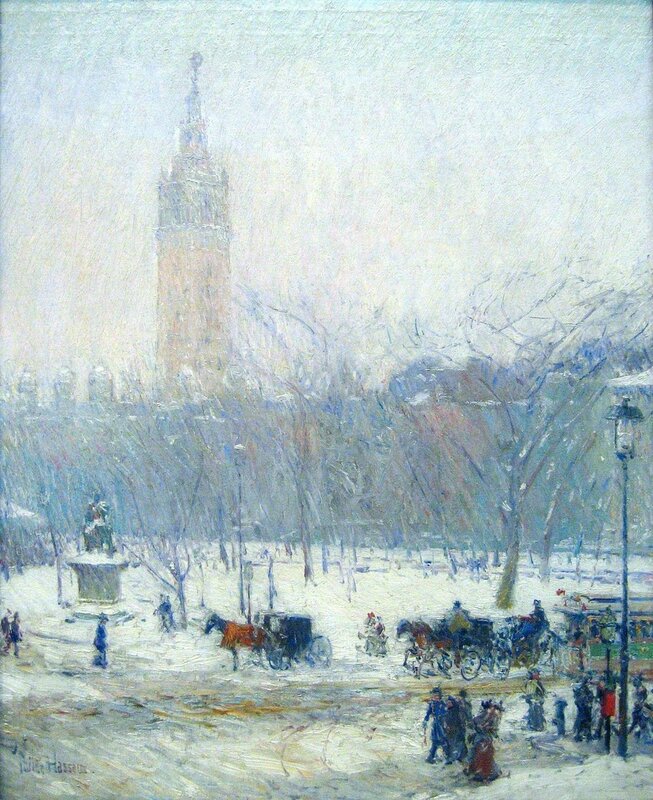 Not far from the Madison Park Hassam portrays now stands the Flatiron Building, constructed in and immortalized in the Stieglitz photograph of 1903, showing it also through a haze of snow and from the perspective of that same Madison Park, which is also blanketed in snow. That is very much in keeping with Hassan’s view of the area and suggest that Hassan was onto something new in the way of realism rather than moving backward to the European Impressionists. He and the photographer shared something in common: a desire to be accurate rather than, to borrow a term, impressionistic, in the way they captured the look of being in the presence of architecture during a snowstorm. A third painting of Hassam’s, “Church at Old Lyme”, made in 1905, is also worthy of careful attention. It also captures a season, this time fall. The front of the picture are trees losing their red leaves and the front of the church property blanketed with these leaves. This might give the impression of Impressionism because of its concern with the color and overall look of things, but between the trees can be seen an old church that is rather impressive, as New England churches can be, even if they are bereft of the ornamentation characteristic of Catholic churches, and are, instead, white wood structures, in this case made impressive by its two stories and its large bell tower and its columned front. There is a green door at the top which is for entry to the bell tower or perhaps just a place whose slats let out the sound. The door to the church has over it a semi-circular window. What is important about the church itself is that it is rendered very realistically. Its lines are hard edged rather than shimmering in the sunlight; its details, such as they are, stand out behind the glare of the trees, as if nature is impressionistic while the creations of people are real and objective. The church is imposing, a found object in the midst of nature, a tribute to human creation, and so elevated beyond its deserts as an art object. Or at least that is what an observer can take away for the picture, which is food for thought about what is important in life and so not just the casting of a mood. That is the “meaning” of this painting, though nothing so portentous may be meant by an artist interested in painting what he sees with all the contrasts and tensions that may entail. Think, by contrast, of a true Impressionist’s take on a church: Monet’s many views of Rouen Cathedral, whose point is that the facade looks different in different lights and that the viewer wants to appreciate that, sense that any image of the place holds true only for a moment even if the idea of it remains in mind as a permanent or unchanging entity. The reality disappears inside the moment. So here is what we can say about the nature of realism. It doesn’t mean portraying economic life or being unemotional, as might be true of the Realist novelists of the time. It is being accurate as when “Godfather II” is accurate down to the lawn furniture outside a casino during the time in which it is set. Realism is when the presentation is less important than the object presented, and the artist takes credit for getting it right rather than for making it beautiful or finding the beauty in it. Hassam got the church right; there are numerous churches like it all over New England that look that way in the fall. It wouldn’t matter if he took a picture or snapped the shutter on the other side or through more trees. The object remains the same. So beauty is not created by the artist but is a characteristic of the object, and so the arrangement of the pictorial elements is a less important, even arbitrary, matter. Why things rather than pictures are beautiful is a very difficult question, because the question does not rest on the balance of elements in the composition but in the nature of things, that leaves and buildings are emotionally charged, but that is the way it is. Women are beautiful, and what John Singer Sargent, for example, who is Hassam’s fellow realist, does is merely allow them to be, however hard that may be to accomplish because there are so many limitations in artist’s abilities to allow the subjects of their portraits to shine out for what they are. There are a number of departures from the realistic movement that dominated European and American painting in the mid Nineteenth Century. There was the medievalism of the Pre-Raphaelites in England; there was French Impressionism; there was the international Modernism that engaged in the distortion of figures. There was also something else, perhaps a kind of neo-realism, whereby Hassan and others found new techniques for realism. Hassam could have been recognized to be what he in fact was: a realist who added color to the earlier Nineteenth Century realism of Courbet, just as Manet did. But that is not what happened. Instead, European and American and English painting were dominated by the focus on structure and color whereby Whistler turned into an early abstract expressionist, while German painting evolved into the study of grotesque characters, into expressionism, as American painting became dominated by the vision of the alienated individual as in Hopper. Realism has not returned to American painting. Instead, it is Hockney’s world of subtly colored and stylized people and places, another form of modernism. Perhaps photography and film is where realism now resides.